Evan Ziporyn began a gamelan – a Balinese orchestra – at MIT. This year, he and the 30-member group performed at Carnegie Hall. “I was thrilled, but the students were through the roof,” he says. “The concert wasn’t until 4 pm, but the entire group showed up at 10 am, just because they wanted to stay back stage as long as possible. Ziporyn, who has performed across the globe, has recorded five CDs himself and appeared on more than 30 CDs with others. Much of his work is a mix of Eastern and Western instruments and electronics, and much of his music defies all genres. Gamelan, a Balinese orchestra, features mostly percussion instruments, including gongs, chimes, cymbals, and drums. 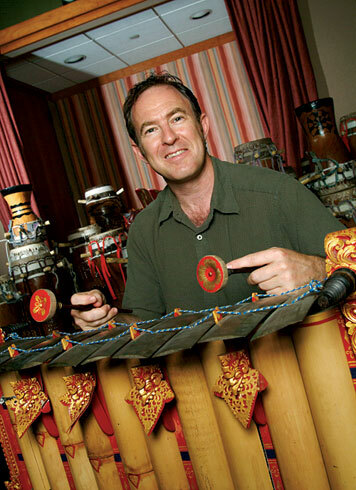 Ziporyn first studied Balinese gamelan as an undergraduate and went to Bali for a year in 1981. Later, at graduate school on the West Coast, he became involved in gamelan again and later returned to Bali. He fell in love with the music and the culture, so when he came to MIT, he decided to begin a gamelan here. The MIT group has performed dozens of times across the East Coast, and Ziporyn’s compositions propelled MIT’s group onto the world music scene. It was Ziporyn’s own work for gamelan and western instruments that the MIT group performed at Carnegie Hall. Ziporyn is also a member of the Bang on a Can All-Stars, which is a group that is part classical, part rock, part jazz. It originally began as a new music festival in New York City in 1987. Since, it has become a bold institution of festivals, concerts, publishing, recording, teaching, and touring. His goal for the future, he says, is he would love to see the gamelan flourish, and he’d also like to reach out to the larger community by composing bigger pieces that involve theater.